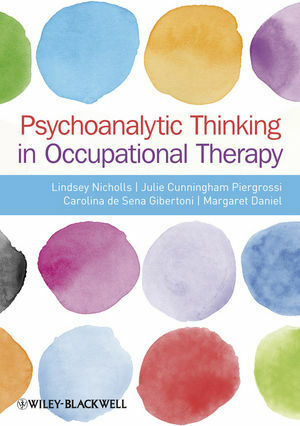 Divided into three overarching themes, theory, application and research, this cutting edge book explores the influence of psychoanalytic theories on occupational therapy practice and thinking. It incorporates a new conceptual model (the MOVI) to guide practice, which uses psychoanalysis as a theoretical foundation for understanding therapeutic relationships and the ‘doing’ that takes place in clinical practice. Using practice models and incorporating many clinically applied examples in different occupational therapy settings, this introductory text to psychoanalytic theory will appeal to students and practising clinical and academic occupational therapists worldwide and from different fields of practice from paediatrics and physical disability to older adult care and mental health. Lindsey Nicholls, PhD, is a lecturer at Brunel University, London, UK. Her doctorial study used psychoanalytic theory to explore the symbolic and relational encounters between occupational therapists and their clients in acute medical settings. Julie Cunningham-Piergrossi is a psychoanalytically trained occupational therapist, Milan, Italy. Carolina de Sena-Gibertoni is a psychoanalytically trained occupational therapist, Milan, Italy. Margaret Daniel is a Clinical Specialist OT in Psychotherapy working in a NHS Psychotherapy Clinic in Glasgow, Scotland and is a senior accredited counsellor with the British Association for Counselling and Psychotherapy.